The comparison of the dimensions and weight of the 5 best smartphones in May 2013 are being made. The five best phones included in this comparison are; (sorted alphabetically) HTC First, HTC One, LG Nexus 4 E960, Samsung Galaxy Note II and Samsung Galaxy S4. (For the comparison, we have included inches and millimeter in the measurement but for the detailed measurement of length, width and height, we have used millimeter). For the easy comparison, we have drawn the measurements into graphs which are easy to analyze. 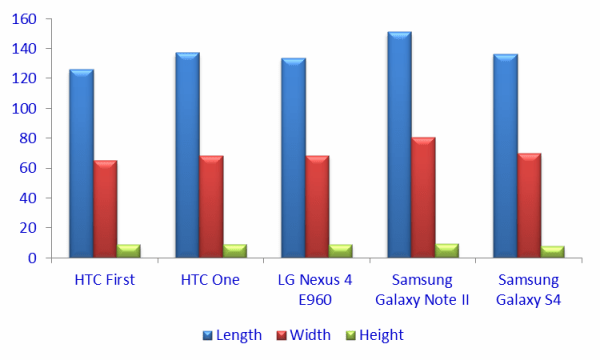 When we analyze the graph, displaying the length, width and weight of the 5 smartphones, apparently, it appears that Samsung Galaxy Note II has the highest length and the width while the HTC One has the lowest length and width. 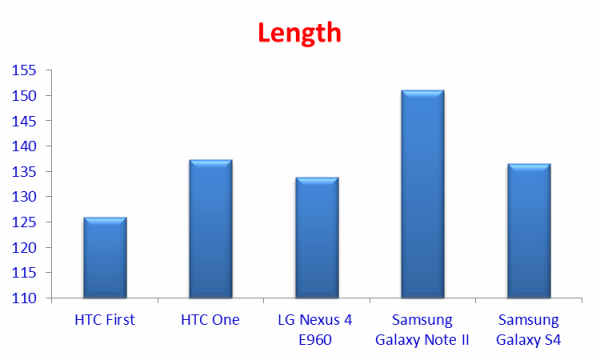 For the minute analysis, we have displayed the length, width and the height of the 5 smartphones separately: The graph of length of the five smartphones compared the length of the five smartphones and first, second, third, fourth and fifth ranks are acquired by Samsung Galaxy Note II, HTC One, Samsung Galaxy S4, LG Nexus 4 and HTC First respectively. 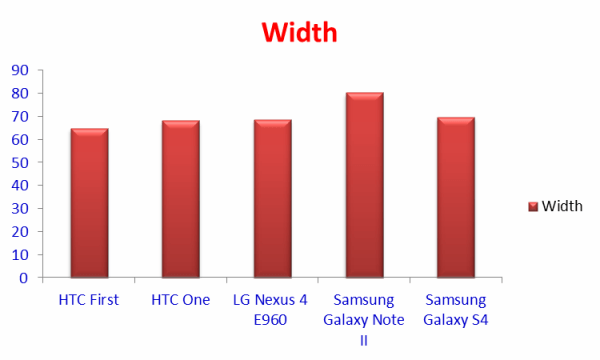 Width wise ranking of the five smartphones is as follows: Samsung Galaxy Note II, Samsung Galaxy S4, LG Nexus 4, HTC One and HTC First. 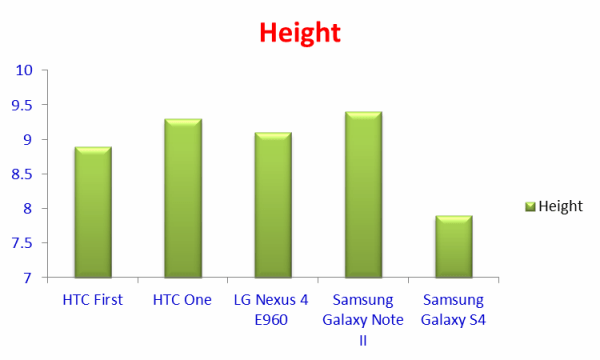 Height wise comparison shows the following ranking: Samsung Galaxy Note II, HTC One, LG Nexus 4, HTC First and Samsung Galaxy S4. 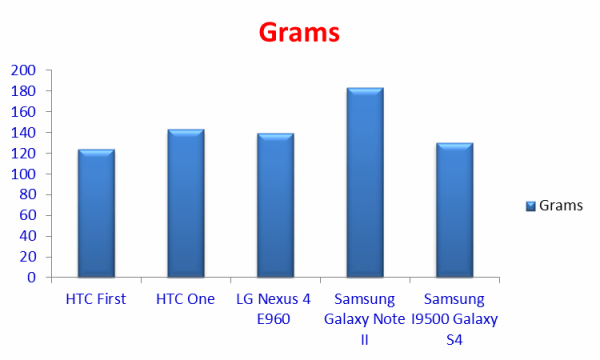 For the comparison of the weight, the graph given above ranks the weight of the five smartphones as: Samsung Galaxy Note II, HTC One, LG Nexus 4, Samsung Galaxy S4 and HTC First. The Mutual comparison has been left with the viewers. How to See Total Internal Memory & Used Storage of Android Marshmallow smartphones? How to See Internal Storage, Used by Apps in Android Marshmallow Devices? How to Activate Kill App Back Button in Android 6.x Marshmallow Smartphones? How to See Individual Apps Data Usage in Android Marshmallow Smartphones?